Accuweigh collaborated with QWM and Scale Components on a solution for weighing road-going haulage tractors carrying extremely heavy loads for the WA mining industry. 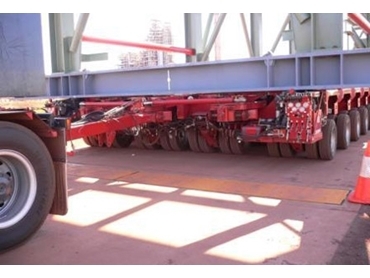 A plant equipment fabricator in Western Australia required a dependable and precise weigh system to ensure their heavily loaded tractors complied with legal load restrictions on local roads and bridges when delivering their manufactured structures. Weigh in motion truck scales measuring 6.5 metres wide were custom-engineered by Accuweigh to weigh the load on each of the 34 individual axles of the haulage tractors, which can carry loads of up to 500t. A static axle weighing system would require frequent start/stop sequences, resulting in wear and tear on the tractors. The two weigh in motion truck scale decks were manufactured by QWM in Brisbane while Scale Components provided the sophisticated Systec IT8000 digital weight controller with specialised in-motion software and Accuweigh’s WA branch assisted the installation and commissioning of the trade approved scales.